High-end connector patented from I/K audio. Connector is made by hand from high quality materials. It is used selectively dry wood under natural conditions / minimum 8 years /, genuine leather, aluminum, copper and precious metals / silver, gold, rhodium, platinum /. Installation of the connector is easy and does not depend on the thickness of the panel unlike the known panel connectors. Suitable for any thickness of the wall of the loudspeaker or amplifier. 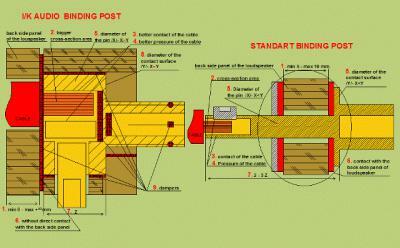 The design allows for attachment of cable to 17 sq. mm connector "banana" 4 mm type and connector "fork" 8/6 mm type. Connector has very good damping properties, magnificent contact area and very short signal path / to 3 times shorter and up to 2 times as large cross-section of the known connectors /. 1. Easy installation, regardless of the thickness of the rear panel of the speaker. 2. bigger cross-section area to the speaker and loudspeaker cable. 9. A great dempf and dampers stabilizers.